Containing fuel spills and chemical discharges is mandated by parts of the Clean Water Act—specifically the National Pollutant Discharge Elimination System (NPDES) and the Spill Prevention, Control and Countermeasure (SPCC) regulation. Geomembranes are a great choice for these applications because they are cost-effective, durable and proven. For NPDES compliance, the most common applications involve lining stormwater runoff ponds in rail yards. These prevent stormwater that could potentially contain diesel fuel and other rail yard runoff from entering the outside environment. 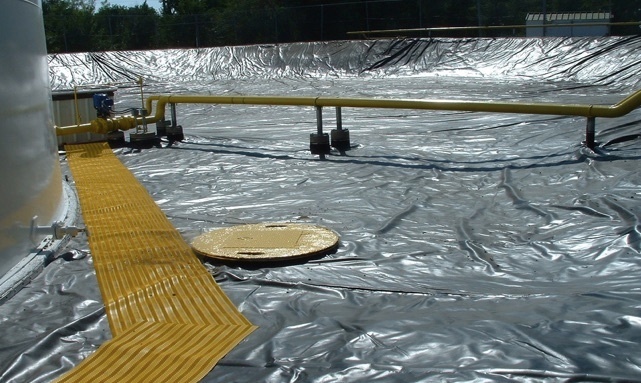 Under SPCC, geomembranes are often used for secondary containment around aboveground diesel fuel tanks. These mandated liners are also common around jet fuel tanks at airports and military bases. Chemical and fuel resistance. Diesel fuel and chemicals can cause some geomembranes to break down. The right choice will be compatible with hydrocarbons and have a low-permeation/vapor transmission rate. UV resistance. All or part of a liner will always be exposed to UV rays, so long-term UV resistance is critical. Geomembranes that break down due to UV exposure require more frequent replacement and can cause non-compliance due to premature leaks. Longevity. Select a geomembrane with a great track record in the rail industry. A high-quality liner should provide a minimum of 20 years of great service. Strength. Choose a product with high tensile strength. A geomembrane with a supported backing provides maximum puncture resistance. A rail yard is a challenging environment, so pick a tough geomembrane that can stand up to abuse. Good thermal properties. Unsupported geomembranes expand and contract with temperature changes. This can lead to environmental stress cracking and exacerbate UV damage. Flexible design options. Products with choices like weldable walk mats allow for safe and easy maintenance and inspections, and ease the loading and unloading of fuel. Heat welding the walkmat to the parent liner adds strength and the mats provide a textured and highly visible walking surface without requiring a gravel or soil cover over the liner. Keeping liners exposed provides an advantage when it comes to inspection and maintenance, and it makes any required cleanup much easier. Whether you’re relining or lining new projects, making the right call on a geomembrane will allow for decades of worry-free service. To learn more about how geomembranes serve the rail industry, contact XR Geomembranes.